Recently congress decided that the FCC had overstepped their appropriate role with proposed rules limiting the ability of ISPs to collect and sell consumers information including websites visited, searches made, and more. The worst abuses of consumer privacy so far have been from cell phone providers, but Comcast, Frontier and Century Link may not be far behind. Essentially, congress has determined that your ISPs and cell phone providers will be governed by the same rules as the FTC requires for Internet companies like Google, Microsoft, Facebook and Amazon. Most of the major ISPs have including Verizon, AT&T, Comcast and more have agreed not to sell sensitive information unless you explicitly opt-in. However, they retain the right to sell your browsing history and other "non-sensitive" information unless you explicitly opt-out. I do not expect anything to change for a while. Many people are upset about this, but it is merely one small step toward a future without the notion of privacy. You are being tracked already and congress, whether Democrat or Republican, is not interested in changing that. Our government wants to track you as much as advertisers do. Having the ISPs collecting your information and browsing habits is convenient for them. In addition to the tracking of your ISP, there are plenty of current trackers which neither congress nor the FCC was addressing. Your Browser is tracking you. The Chrome browser, Safari, and Edge are tracking you. Firefox is beginning to track you a little bit but with significant safeguards in place. Their users are more sensitive to tracking than most users. Your search engine is tracking you. Google, Yahoo, and Bing all track you. Most of the websites you go to have trackers from the advertising companies and others recording your activity and combining the results of your visits to various sites to build a profile on you. I just visited the Blazers on OregonLive and was attacked by 34 malevolent trackers from 20 different companies. If your cell provider or ISP installs software on your phone or computer, then anything and everything you do is theirs. That software could sit as middleware between you and anyone you communicate with regardless of what privacy protections you have in place. In the past Cell phone providers like T-Mobile, AT&T and Verizon have severely compromised our privacy for their profit. Windows 10 tracks you. With Windows 10, Microsoft has joined Apple and Google in providing us with an operating system that will make money by tracking us and selling our information. Social media companies like Facebook are using trackers to sell you browsing habits. Other Internet companies like Hulu, Netflix, Amazon and anywhere else you setup an account could potentially sell the information they have unless you opt out. There are some things you can do to mitigate this situation. Use a privacy Browser. I recommend replacing your current browser with Cliqz. I wrote an article about it here. Cliqz will not sell your information. Your information will remain on your own computer. I use Cliqz Mobile browsers for my phone and tablet as well as well as Cliqz browser on my desktop computer. Startpage: Is an excellent Dutch privacy search engine that strips out your information and then gets search results from Google. It is really a Private Google search engine. It is an excellent option for those who like Google's search. Qwant: is a French privacy search engine which also does not keep your private information. It has its own engine and supplements it with results from Bing. I wrote an article on them here. This is currently my favorite search engine. Because I use Cliqz, these are built in. But for users of other browsers, I suggest Adblock Plus for Ad blocking and an extension to stop tracking. I do prefer Cliqz as its technology seems better than add-on extensions. Sometimes blocking will break a site and you will need to enable tracking to get the information you want. But Cliqz breaks apart the tracker and inserts random information where the unique identifier is. Then it lets the tracker continue tracking the made up random subject. This seems to cause fewer problems. If you don't use Cliqz, my three recommended extensions are. Use only one. We have accounts in many online places. Many of those have privacy account settings. Most of us never check with those accounts. 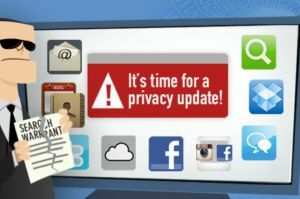 Facebook, Google, Xfinity and others are collecting information about us, but allowing us to stop them if we can maneuver through their menus to the privacy settings. So, you should actually go into your accounts and set your own privacy settings to where you want them. You should return periodically and reset them as some sites change their menus and remove your privacy settings. Google takes you step by step through their myriad of privacy settings here. Xfinity lets you opt out of some tracking here. Google Chrome Browser: HowtoGeek has a good article on maximizing your privacy settings if you use the Chrome browser. I wrote the following email to my cell phone provider. Use it as a model to inquire about their tracking. Does USMobile collect any information about my browsing history, email, contacts, etc. for sale to advertisers, as opposed to using it for yourselves. Will they in the future? Do you have any plans to install any middleware on my phone which would allow you to track me more efficiently? If you are committed to our privacy, a clear message on your home page could increase sales. I received a quick response making it clear that they were not and do not plan on tracking me or selling my information and that they would not install middleware on my phone to track me. Buy an unlocked phone from a third party (like Amazon), not our cell phone provider. Purchase our cell service from a cellular reseller, not a direct provider. It is the main providers like AT&T, T-Mobile, and Verizon who are most likely to install software to violate our privacy and security for their benefit. A VPN really requires another article, so I wrote one here. Excellent Article on privacy protection and the new rules from Cliqz. One of the most balanced articles I've read (but still favoring privacy advocates). ArsTechnica article with ISPs denying they will track you. For example, Comcast, which operates its own advertising network, says it won't sell its information to other advertising networks. Link to PDF document most ISP agreed to while lobbying for the change. This spells out the protections they are currently offering us. Test your Browser for Privacy concerns. EFF (Electronic Frontier Foundation) provides a tool to test the privacy and tracking protection in your browser. Treasure trove of Privacy information and tools: https://privacytoolsio.github.io/privacytools.io/ . These people are fanatics, and make me seem like I ignore privacy and security, so do not panic. But they are an excellent source of information. Surveillance Self-Defense. This is a large collection of training tutorials, lessons and advanced briefings on defending yourself from surveillance. Worth a close look regardless of your level of expertise.